Want to buy a nice suburban lot? 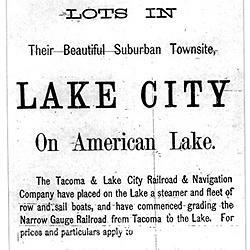 Charles Naubert and Frank Ross, agents for Tacoma & Lake City Navigation Co. Land Sales, would love to sell you one. 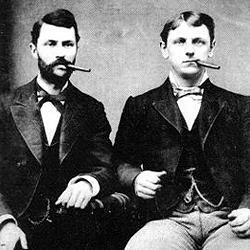 A portion of the poster used by Messrs. Naubert & Ross to promote their proposed development. The Lakewood Historical Society celebrated not one, but two quasquicentennials during its annual meeting on November 18. 125 years ago, Washington attained statehood--and nearby Lake City was founded on the shores of American Lake. Nancy Covert, author of Lakewood’s latest history book, American Lake Vignettes, shared the colorful stories behind the founding of Lake City and some of the people, places and events that have played their parts in its history over the succeeding years. Nancy also attended the recent statehood anniversary ceremonies in Olympia and presented her photos and impressions of the big day. The program followed a short business meeting covering the accomplishments of the Society in 2014, election of board members and honoring the outstanding volunteers of the year.